Denon DJ just announced the SC5000M Prime, a media player with a motorised jogwheel platter. Denon DJ has just unveiled the SC5000M Prime, a media player that’s got a motorised spinning jogwheel platter. 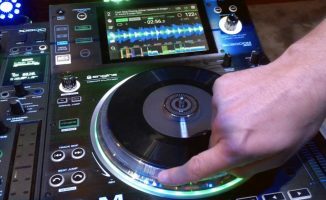 It aims to provide DJs with an experience similar to that of using a direct-drive turntable, but with the conveniences of digital DJ technology. The top of the platter is an actual piece of 7″ vinyl, and it’s got tension controls and two torque settings for customising the platter to your preference. The rest of the SC5000M Prime is similar to the SC5000 Prime: It has a 7″ high-definition touchscreen, dual-layer playback, eight performance pads, 3x USB and 1x SD card slots, a LAN port for hooking up to other Prime series hardware, and the ability to play high-resolution FLAC / ALAC files. Unlike the SC5000 Prime, the SC5000M Prime doesn’t have a display in the centre of its jogwheel. The SC5000M Prime is primarily aimed at turntablists and DJs who currently perform with DVS. 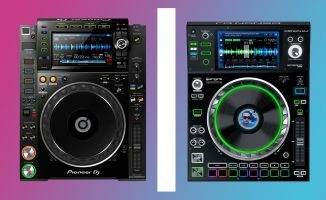 Despite all the cool things that a contemporary media player like the SC5000 Prime or the Pioneer DJ CDJ-2000NXS2 provides, one thing that both these players lack is a motorised spinning platter. The SC5000M Prime plugs that gap. Such a feature is not an absolute essential, but there is a difference in feel when you’ve got something physically rotating underneath your hand as you scratch and beatmatch, and it’s for that reason (among many others) that some DJs still prefer to use a turntable. 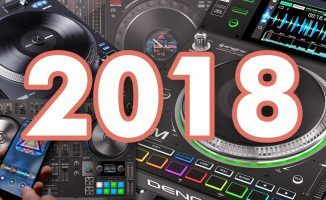 This isn’t actually a new concept: the Technics SLDZ-1200 introduced in the early 2000s was the first digital media player to have a spinning platter onboard, and Denon DJ also put out a player with a motorised platter back in 2009 with the DNS3700. Numark’s NS7 series of DJ controllers also has motorised platters onboard, and even boasted a standalone unit (the Numark V7) back in the day. By merging the “old school” analogue physics of a spinning platter with the conveniences and performance advancements of digital, motorised DJ media players and controllers aim to bridge the divide in kinetics between turntables and digital DJ kit. Spinning platters are quite niche, though they’ve got a following, and the SC5000M Prime seems to want to fill that space especially since its main rival Pioneer DJ still has not put out a motorised media player as of this writing. Check out our video below, along with the promo video and photo gallery. • The Denon DJ SC5000M Prime retails for US$1899 and will be available from autumn 2018. 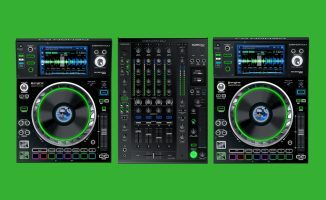 Check the Denon DJ site for more details. What are your thoughts on this media player? Think motorised platters are cool, or are they gimmicky? Let us know below. Certainly hotting up out there! Joey – you need more deja vu! 😉 Denon had motorized patters WAY before 2009. I picked up my S-3000s way back in 2002. But back to the units at hand… Considering all the moaning and groaning this past year over on the Denon forums from people saying they want a motorized platter to replace their HS-5500 / S-3700 / SC-3900 I suspect this will be very well received. I’m actually a little surprised to see this unit. I really thought inMusic was going to keep all the motorized product under the Rane banner going forward. But as a Prime owner I’m happy to see them expand the ecosystem. The more models available, the more likely the whole ecosystem takes hold and makes an impact. Now that they have rounded out the high end of the product line nicely, they need to get some mid-level products out (cough, cough, MC8000mk2?). Is a new V7 coming as well? The V7 was the perfect Serato controller. I should have never sold my first one. ow can i get one WITHOUT jogs at all. replace them with 4 faders for STEM control and who’s know for the rest of the space. more buttons. bigger screen. or maybe N.I. could release an S8 that doesn’t need a laptop. i have the MCX-8000 for noble and keep going back to the S8 for fun. now that SoundSwitch hasn’t Ableton Link, i may just sell the MCX8k and get a line mixer for the extra mic inputs and.. just not what i want. ok 2 D2’s and a A&H DB4 and wait still laptop there and no light control options. I would love to have tbe feel of vinyl this would be the answer. When Pioneer release the first the CDJ-1000. Denon release the belt driven spinning platter DN-S5000 which was really a single deck version of the rack mount DN-D9000 dual cd deck. Which played two tracks at once, 4 cues and 4 loop cues, 2 samplers, filter and eq mode and on board effects. The Technics SLDZ-1200 was not first. They was release after the DN-S5000. It’s a shame Denon don’t get the recognition for past releases that was ahead of it’s time. If anything, the Technics SLDZ-1200 was the first spinning platter deck to fail, according to DJs that purchase them. 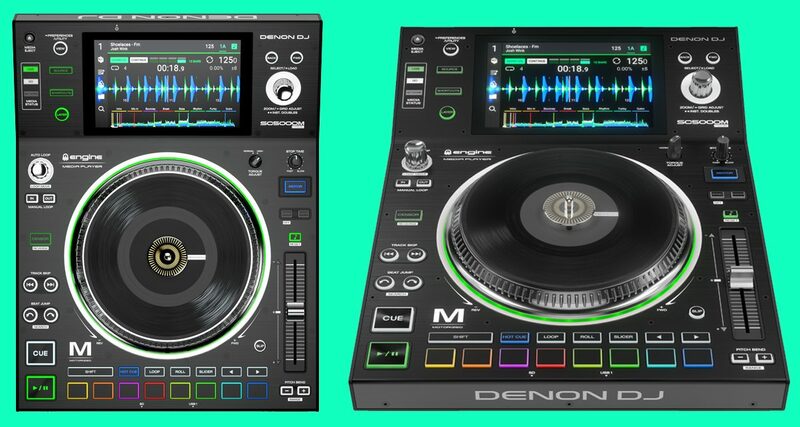 Hopefully PioneerDJ will come out next generation of CDJ/DJM products perhaps either 2019 NAMM show in Anaheim this January or MBLV 23 in Las Vegas this March.As far as New Denon SCM5000M it’s same motor as Numark NS7/V7 motor which is wasn’t impress at all. What mankind really wished was Sc5000 with 12 inch motorized platter to bring back that manly appearance.